For over a century, the Bertazzoni range has represented the absolute highest standard of quality in kitchen appliances, particularly cooking ranges. Bertazzoni has received widespread acclaim from industry leaders and customers alike, who love their combination of high-end looks and unparalleled price-performance ratio. In 2018, Bertazzoni has unveiled their largest major improvement to the range lineup since 2005. Bertazzoni has said that this much-anticipated refresh is based almost entirely on reviews and requests from loyal users, who love the Bertazzoni brand but have occasionally brought to light some ways in which these beloved ranges could be improved. The brand has also put renewed emphasis in providing designs that appeal to both modern-minded users and traditional sensibilities as well. With that in mind, let’s take a look at some of the fabulous updated features now available thanks to this Bertazzoni refresh. Pro-Tip: Contact our sales team at (888)714-4938 for promotions on Bertazzoni ranges and kitchen appliance packages. The stovetop section of each Bertazzoni range has received several major updates, all designed to make cooking, cleaning, and overall use far easier and more powerful. They also include visually-centric features like a new standard island trim which allows you to display uninterrupted backsplash for a clean look. When it comes to functionality, the updated ranges feature 15% more cooking space to handle larger pots and pans, plus grate plates with smaller gaps which allow for easier sliding along the cooking surface. The monoblock design of the burners ensures that there will be no fallen pieces and that cleaning will be a snap, while the griddles themselves heat 50% faster than on previous models. Meanwhile, a 19,000 BTU ultra-powerful burner offers 11% faster boiling and a low simmer feature, while the 36” and 48” models will also feature a second main burner that also packs 19,000 BTUs of power. Base models will feature standard aluminum burners while all pro models will boast durable and highly decorative brass burners. Don’t worry—Bertazzoni hasn’t neglected the ovens in their new ranges. Each one is now an impressive 40% larger, with full-width glass doors devoid of screws or grease traps for an elegant, streamlined look. Each oven also boasts two convection fans placed horizontally in gas ovens and diagonally in electric ovens for optimized cooking performance. When broiling, a new 15,000 BTU infrared broiler means there’s no need to shuffle items while cooking. And one of the most powerful new features is a gas burner that stays on throughout the cooking process rather than switching on and off, allowing for lower temperature fluctuation and better cooking. The oven racks can be positioned in 7 different configurations as well, while the soft-close oven door is particularly luxurious. Overall, the new Bertazzoni ranges offer a supremely improved oven experience. In addition to these major changes, there are also some design-minded updates that are sure to delight customers everywhere. These include new stainless steel knobs with a weighty, luxurious feel and easy removal for cleaning, plus a clean-looking white thermometer in all gas and dual-fuel ranges. The newly framed controls with beveled edges also add a modern, three-dimensional look that brings to mind high-end luxury and style. This approach is also matched by the handles of the Pro and Master series, which are now bolder and even beveled in the Master series. Along the back side of the range, the gas pipe and electric box have been fully hidden to allow for flush installation that doesn’t require cutting into drywall. Finally, each model now offers reinforced metal legs to prevent common damage that can occur during delivery or movement. 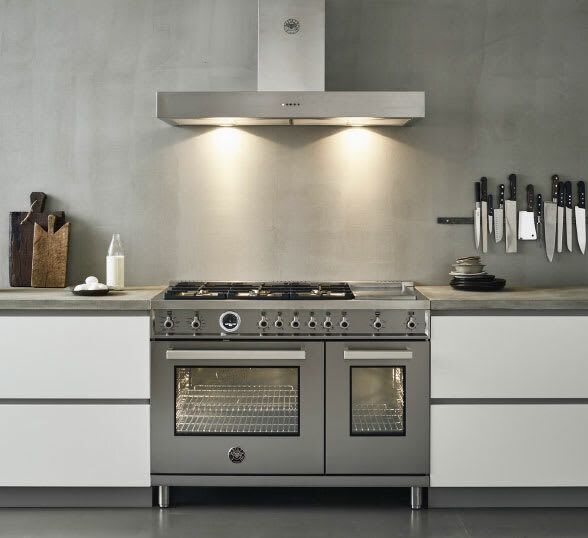 Overall, Bertazzoni has taken an already impressive line of ranges and brought them firmly into the modern era with stunning designs and powerful new features that are guaranteed to impress. If you’ve had your eye on Bertazzoni for some time now, it may be time to make your move toward unprecedented luxury and cooking power. We reviewed Bertazzoni ranges extensively with 5 things to know before purchasing.